This is an Olde English and Anglo-Saxon personal compound name which has had a long period of development from its original 'Agihard'. 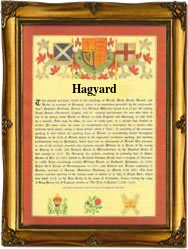 Hagyard is the modern Yorkshire development and means 'the son of Hacgard' and in the 1880's was found only in the Bridlington area. Prior to that date, it derived from the Suffolk (East Anglia) area where the normal spelling and all early recordings was Hacgard back to Ivo Hacgard in 1273, Suffolk. The earliest of all recordings takes the name back to Lincoln where the spelling was in Latin following the Norman Conquest. The first recorded spelling of the family name is shown to be that of Acardus de Lincolnia which was dated 1150 The Feudal Rolls of Lincoln during the reign of King Stephen (Stephen of Blois) 1135 - 1154 Surnames became necessary when governments introduced personal taxation. In England this was known as Poll Tax. Throughout the centuries, surnames in every country have continued to "develop" often leading to astonishing variants of the original spelling.